Coming on the heels of a widely-reported sighting at Chicago’s O’Hare international Airport of a small, hovering gray metallic disc, the tenth anniversary of “The Phoenix Lights” incident promises to renew interest and speculation about these kinds of events. In Arizona, many people will be looking into the night sky. In the early evening of March 13, 1997, a massive V-shaped, boomerang-shaped or triangle-shaped object with large lights on the underside of it was observed by thousands of people across Arizona and Phoenix. The object was reported to be one mile to two miles across in size. Reportedly first spotted northwest of Arizona in Henderson, Nevada, at approximately 7 p.m., the object proceeded in basically a southeast or south-southeast direction somewhat diagonally across Arizona. Its flight path included passing near the town of Prescott and eventually directly over the metro Phoenix area later that evening, including over central Phoenix itself. Like the recent O’Hare International Airport UFO sighting, the object also was observed by personnel at Phoenix’s Sky Harbor International Airport. Air traffic controllers and at least one commercial aircraft crew reported seeing it as the object drifted overhead. By approximately 10 p.m. the massive object was continuing its slow and steady cruise in the same direction as it left the southeast outskirts of the Valley of the Sun. Many videotapes and still camera shots were taken. Calls were made to police and the news media. Local TV stations and newspapers carried the story. The national media reported on it as well. Witnesses were interviewed. Professional investigators of all kinds looked at the circumstances and evidence. 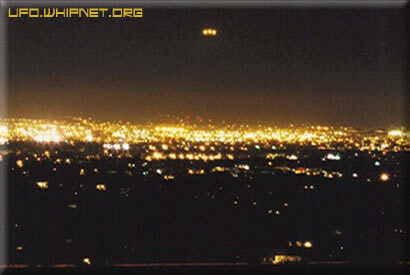 The Phoenix Lights incident became one of the most publicized and well-documented UFO sightings in memory. March 13, 2007, will remind many Arizonans and people around the world that there seem to be interesting things going on. Are experimental U.S. military aircraft flying over our cities and airports? Are citizens having mass hallucinations or thinking perfectly explainable situations in the skies are possible extraterrestrial visitors? Or maybe extraterrestrial visitors and people involved in this situation are trying to gradually and safely prepare us for somewhat surprising news and disclosures. In modern times, reports of UFOs included sightings of “foo fighters” by Allied air crews in World War II. Then, shortly after the end of the war in the summer of 1947, national and international news media reported on the press release from the Roswell Army Air Force base in New Mexico about the recovery of a flying disc. From that point forward, through the 50s, 60s and until now, a fairly steady number of sightings, alleged government projects and activities, purported secret documents, TV shows, movies, books and UFO interest groups continued to emerge. Some researchers say evidence on alleged extraterrestrial spacecraft may indicate that activity like this has been going on over several or many, many past centuries, affecting people all over our Earth. Other speculation proposes that visitors from other worlds and/or other dimensions may travel through time and space in ways we don’t fully understand. The puzzle pieces of the mysteries about this phenomenon continue to hold the interest of millions of people worldwide. Sometimes aspects of the UFO situation bring out our worries or concerns. Sometimes our hopes and wonder. As we consider all the possibilities about what might be going on, it may be helpful to keep our minds open, our hearts steady and brave, our faith strong and our feet on the ground.